This post is written by Marianne C. Halloran, a Classy data scientist. As we’ve recently observed with Hurricane Florence and Typhoon Mangkhut, nonprofit organizations often lead the charge in disaster relief, racing against time as events escalate and help is immediately needed. Through our own platform data analysis, we know that the devastation often created by these disasters brings a sharp increase in donations following the aftermath, with many first time donors committing to one-time gifts as well as recurring. However, disaster relief efforts overall and the need for funding tends to last much longer than a disaster’s media coverage. To understand how donors engage with disaster relief fundraising campaigns, this blog post examines disaster relief campaigns and compares them to regular campaigns occurring during the same time. Below, we cover our approach, storm timelines and a donation volume analysis, campaign conversion rates, and recurring gift retention rates to surface key trends and takeaways that can apply to all nonprofits addressing urgent matters. We analyzed three major recent disasters: Hurricane Harvey (August 2017), Hurricane Irma (September 2017), and the Louisiana Floods (August 2016). We selected Hurricane Harvey and Irma since they occurred within weeks of each other, giving us a better picture of how simultaneous disaster relief campaigns perform during disaster season in one of the most intense natural disaster-ridden years for the United States. The Louisiana Floods, in contrast, happened in a fairly calm year. We’ll review the number of transactions and their timing, conversion rates, and retention rates for crowdfunding and peer-to-peer campaigns. As described below, we found that disaster relief campaigns not only received more donations in the two weeks following a disaster, but also led to higher conversion rates and recurring support that was almost five times more valuable than one-time donations. This finding around recurring givers supports previous data we’ve released in The State of Modern Philanthropy, where we found recurring donors to be over five times more valuable than one-time donors. Hurricane Harvey arrived in Texas on the night of Friday, August 25, 2017, as a Category 4 storm with winds of 75 miles per hour, returning on the following Wednesday for another landfall. Its aftermath left around $125 billion in damages and affected a larger geographical area and population than Hurricane Katrina: 13 million people affected, close to 204,000 homes damaged or destroyed, and over a million cars wrecked. The 52 tornadoes it produced extended Harvey’s devastation to the nearby states of Louisiana, Mississippi, Alabama, and Tennessee. A few weeks later, Hurricane Irma made history as the strongest Atlantic basin hurricane ever recorded. Another Category 4 storm, it landed in the Florida Keys on September 10, 2017. It produced 25 tornadoes, affected at least nine US states, and caused the evacuation of close to 6 million residents, raking up around $51 billion in damages. The effects of those storms are still affecting people today. 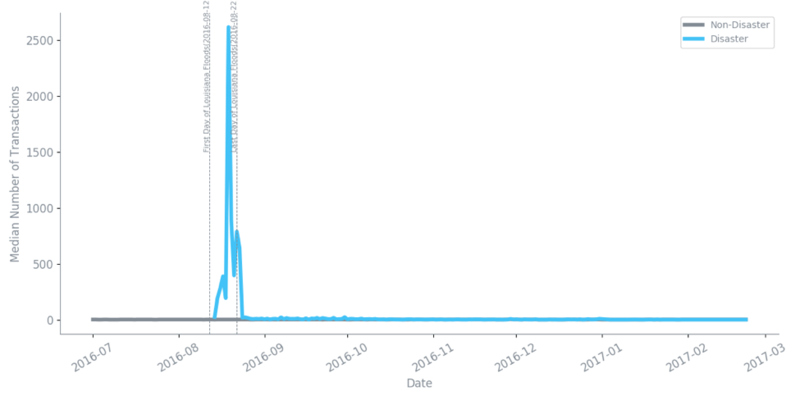 If we look at the number of transactions Harvey’s campaigns’ experienced, we see a sharp increase within a few days of the disaster. Hurricane Irma, happening in the midst of Harvey’s aftermath, received a quicker response. 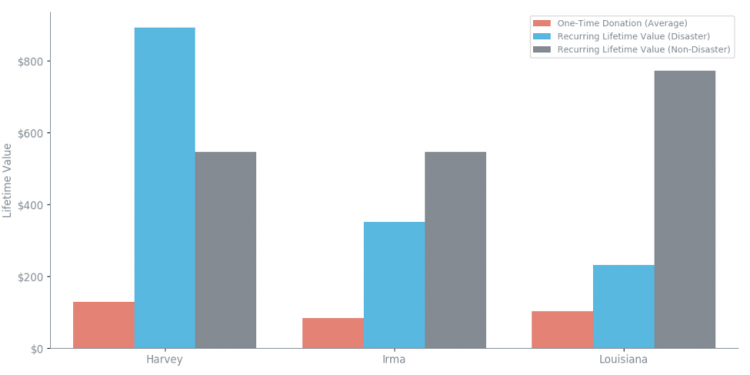 Although donors’ initial response to Irma was quicker than to Harvey, it was also brief. 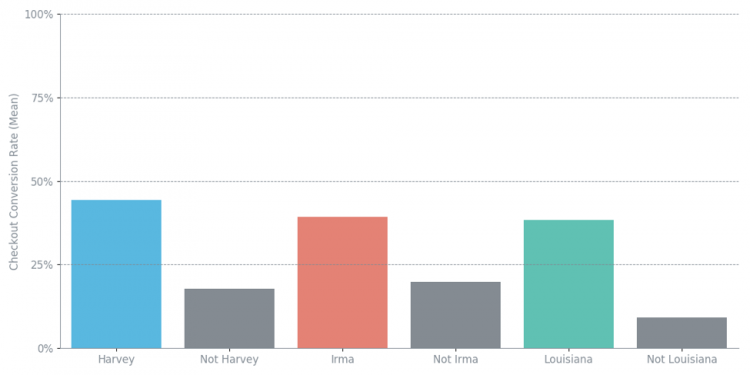 Hurricane Harvey’s median number of donations per campaign stayed above the non-disaster baseline for a month (31 days to be precise) while Irma’s only lasted for 11 days. Many factors could have contributed to this difference, including differences in media coverage, organization outreach, and donor responsiveness. For the Louisiana Floods, which took place a year before in August 2016, sustained rainfall brought over 6.9 trillion gallons of rain over most of southern Louisiana and Mississippi. With daily rain averages reaching 30 inches, devastating floods followed, leading to 146,000 homes destroyed and $10.6 billion in damages. For the floods, a similar trend to Harvey’s is observed: responses trickle in and peak a few days after the disaster, but return to normal levels within 36 days. 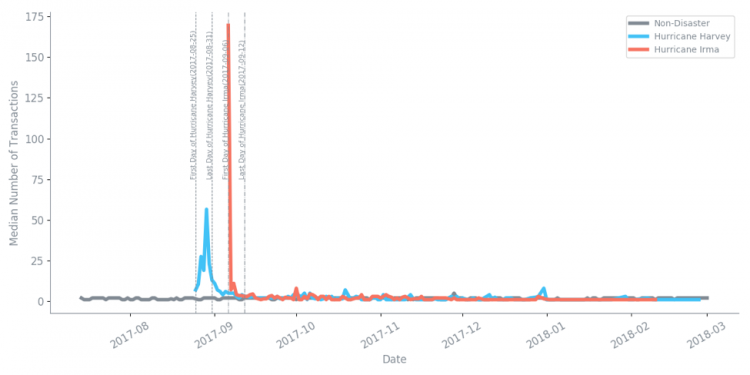 In our analysis, we also observed that the urgent nature of disaster relief efforts pushes the checkout conversion rates of disaster campaigns to higher numbers . On average, disaster relief campaigns have higher checkout conversion rates than non-disaster campaigns, when we compared conversion rates on campaigns directly related to the disaster and unrelated campaigns during a disaster’s time period. When we break it down by campaign type, crowdfunding campaigns generally show higher conversion rates than non-disaster crowdfunding campaigns, whereas peer-to-peer campaigns tend to show lower conversion rates. The most surprising statistic we want to share is around recurring donors. A recurring donor is a supporter who has agreed to give regularly, and most recurring donors contribute on a monthly basis. As previously mentioned, we explored the financial return of recurring giving in The State of Modern Philanthropy. In our analysis, we found recurring donors to have the highest lifetime financial return, over five times more than one-time donors. When we explored recurring donations as they specifically relate to disaster response, our findings were in-line with our previous analysis—recurring donors are considerably impactful and provide reliable revenue. This reliable revenue is crucial to effective long-term relief as often times, despite brief media coverage, most of the recovery work for a disaster happens for many months beyond the event itself. Based on a survival analysis of our recurring donation data for those disasters relief campaigns and the non-disaster campaigns happening during the same timeframe, we found that the probability of a donor maintaining a recurring plan in a disaster relief campaigns was far lower than other campaigns. But as the graph below shows, even though the probability of a recurring disaster donor churning is higher, those donors stay engaged for several months. However, while disaster campaign recurring donors have lower lifetime value than non-disaster recurring donors, their lifetime value still surpasses that of one-time donors. On Harvey campaigns, recurring donors had a lifetime value of $893 on average, compared to a lifetime value of $129 from one-time donors in those campaigns . We found that recurring donors are seven times more valuable than one-time donors for Harvey’s disaster relief campaigns. For Irma, recurring donors were five times more valuable, and three times more valuable for the Louisiana Floods. Overall, for all disasters analyzed here, the lifetime return of a recurring donation plan is 461 percent higher than the return of a typical one-time donor. That is almost 5 times more valuable, and these recurring donors provide long-term support that disaster relief requires. As disaster relief work spans beyond the time period of the disaster itself, and recurring donors for disaster relief campaigns are more likely to churn, it is clear that communicating the need for continuous support could prove an effective focus area for disaster organizations. Although often fast and fleeting, disaster relief campaigns come with higher conversion rates. 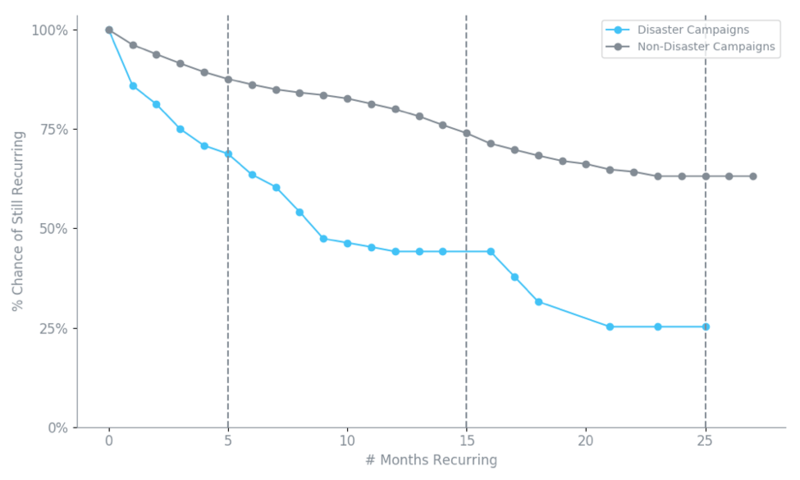 They also produce recurring donors that maintain their recurring giving plans for several months, although they are less likely to stick around than recurring donors in non-disaster campaigns. In addition, the lifetime value of recurring donors is much higher than those of one-time donors, disaster relief campaigns included. While the following points summarize our findings and include questions specific to our disaster relief analysis, any nonprofit addressing urgent matters may find application. It matters when disasters happen. Disasters that occur within a short time of another disaster can get overlooked. Could increasing the number of your organization’s appeals and addressing your communication strategy help? Donations surge during the first few days of a disaster and exponentially fall in volume and amount throughout the following months. How might your organization create a continued sense of urgency after the danger passes, but the work is not yet done? Disaster campaigns have higher conversion rates than the concurring non-disaster campaigns, with crowdfunding campaigns showing the biggest boost. When building a time-sensitive fundraising campaign, do you compare the conversion rates of campaign types to help make your decision? Recurring donors are more valuable for the long-term strategy of disaster relief campaigns than one-time donors. Do you have a well-established recurring giving program that you can advertise during urgent times? Want to dig into how disaster relief fundraising compares to other high-volume fundraising events, such as Giving Tuesday? Check out The State of Modern Philanthropy below. Checkout conversion rates are calculated based on the number of donors that land specifically on a “checkout” page and then get to the “thank you” page. This is in comparison to campaign conversion rates, which are calculated based on the number of donors who land anywhere in the campaign and then get to the “thank you” page.